A majority of the reviewers were impressed by the fashion-forward aesthetics and colorways of the Puma IGNITE Limitless Knit. Plenty of the users praised its comfortable build that made it perfect for working out and running errands. The trainer fit as expected, according to a handful of purchasers. Some consumers remarked that it was made well. A few wearers shared that the footwear allowed their foot to breathe. Many detractors expressed discontent about the footgear running smaller than usual. Several disgruntled testers reported that the knit and mesh upper fell apart after several months of use. A couple of people with overpronation disliked the inadequate arch support. The Puma IGNITE Limitless Knit was critically acclaimed by workout enthusiasts and other buyers for its trendy design and comfortable construction. Other highlights included its appropriate fit, durability, and breathability. However, the model irked some critics for its small sizing. Overall, this flaw still did not deter individuals from considering this footwear as exceptional. The Puma IGNITE Limitless Knit gives new life to the original with its new sock-like knit mesh upper. This fabric gives a sock-like feel to the foot while also being stretchy enough to allow toe-splaying. The TPU Kurim midfoot wrap and heel clip, as well as the gore forefoot strap reinforce the key areas of the upper for support. The current version has retained all of the distinct features from its predecessor. It still has an ankle-high bootie cut that stabilizes the ankle during high-impact workouts. The upper is fashioned into a clam-shell construction with a four-way stretch Ariaprene for a snug yet breathable fit. The sole platform is engineered to provide a supportive, responsive, and cushioned ride. The top layer is the full-length IGNITE Foam drop-in midsole for energy rebound and cushioning. Underneath it is an injection-molded EVA midsole. It is a lightweight compound that absorbs shock, while cushioning and steadying the foot. The bottom is made of crystal rubber for complete ground contract and strong traction on a diverse range of surfaces. It has a lightweight form, so that it does not weigh down the foot. 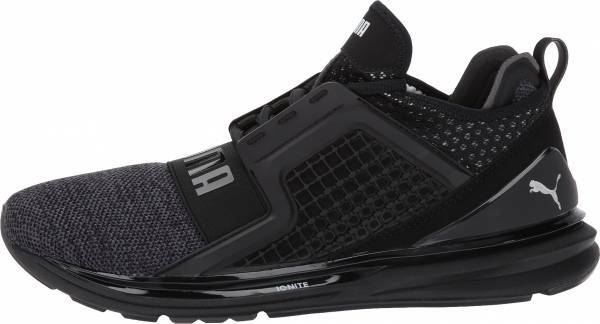 The Puma IGNITE Limitless Knit is a trainer specially made for men. It typically complies with the standard training shoe sizing scheme with US sizes ranging from 7 to 14. However, the form-fitting knit upper may influence the fit and feel too tight for some. It comes in a stanndard D - Medium width profile. The bottom of the Puma IGNITE Limitless Knit is composed of crystal rubber. It is engineered to display a strong grip and contact on various types of ground surfaces. It has two thin openings in the middle for the midsole to peek through. The main star of the Puma IGNITE Limitless Knit is the full-length IGNITE foam insole. It is a polyurethane unit that is designed to be responsive. An injection-molded EVA midsole enhances its performance. It is meant to offer shock absorption, support, and cushioning. The Puma IGNITE Limitless Knit is styled into a bootie-like construction. A knit mesh fabric gives the model its own distinct style and fit. It has reflective accents for visibility in the dark. At first glance, the upper style may remind some of the other popular trainer, the Puma Enzo. The four-way stretch Ariaprene shell has a clam-shell structure that supports the softer mesh fabric on the top. It gives a foot-conforming fit, while still allowing air to circulate within the foot chamber. A TPU Kurim midfoot cage works together with the lace-up closure to secure the footgear. It also serves as lateral support. Meanwhile, a TPU heel clip is made to add stability to the rearfoot area. It also protects the upper fabric from wear and tear. The trainer has two mechanisms to lock the foot down. First, a traditional lacing system that allows users to adjust the fit according to their preferences. Second, a gore forefoot strap wraps around the foot to keep it from moving around inside the shoe.